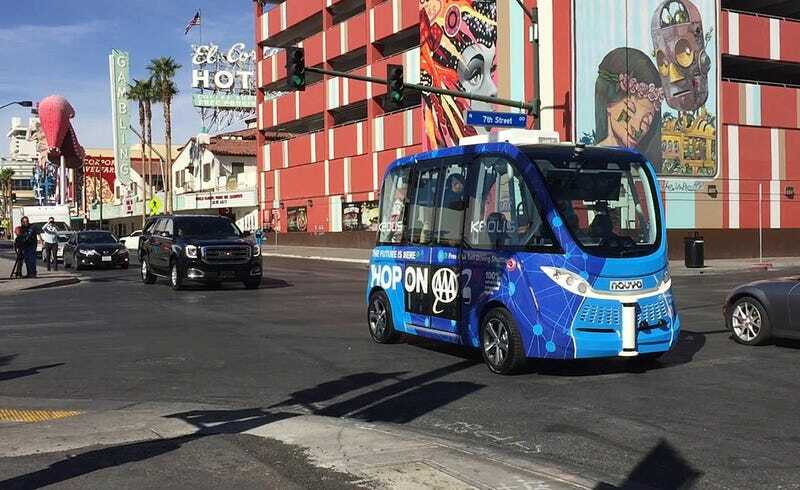 Earlier this week, a truck backed into a driverless shuttle in Las Vegas during the shuttle’s first hour of operation. Was it at all the robot shuttle’s fault? No! Jesus. Jeff Zurschmeide, who was riding in the shuttle at the time of the incident, wrote about it yesterday for Digital Trends, chiding other journalists for writing “sensational” posts about it and including his own description of what he said was a very slow motion crash. This collision, like 90 percent of traffic incidents on our roads, was the result of human error. The truck driver got a ticket from the Las Vegas police. We could see his mirrors the whole time and he should have seen us. But I don’t want to be too harsh on the guy – driving a big truck in Las Vegas is a tough job, and he’s only human. His error could have happened to anyone. On the other side, the shuttle did exactly what it was programmed to do, and that’s a critical point. The self-driving program didn’t account for the vehicle in front unexpectedly backing up. We had about 20 feet of empty street behind us (I looked) and most human drivers would have thrown the car into reverse and used some of that space to get away from the truck. Or at least leaned on the horn and made our presence harder to miss. The shuttle didn’t have those responses in its program. I will be harsh on the guy. If you hit a motionless object while driving—even while driving a large truck, in reverse—it is your fault. It just is. Driverless cars should be able to respond to these types of situations, too, of course, but the expectation that you not hit motionless objects while driving on the roads is... fairly basic. I would even go so far as to say that looking where you are going is the basis for our whole transportation system. Anyway, according to a vice president for Keolis, the company that operates the shuttle, the shuttle in fact did have a horn in use, and also would’ve reversed in this situation. But it couldn’t. If you are out driving today, try not to hit objects that are fixed in time and space. Thank you.